We are an open, inclusive, and affirming More-Light Presbyterian congregation seeking to embody the radical, unconditional hospitality and love of God to whoever enters our doors. All are invited to worship: seekers, the spiritual but not religious, believers, non-believers, and the uncategorized! We invite you to “come and see.” Come to Palisades and see if this sacred place is a faith community in which you can be nourished and challenged in your spiritual life. Service starts at 8:00 PM. Rev. Brandon McLauchlin will be preaching. Coffee hour and Easter Egg hunt to follow. 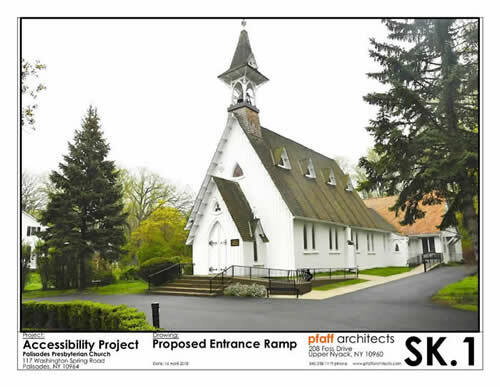 Above is the revised design for the accessibility ramp that was approved by the HABR meeting on May 8. Thank you to everyone who shared their thoughts and comments at our community meeting earlier this year. 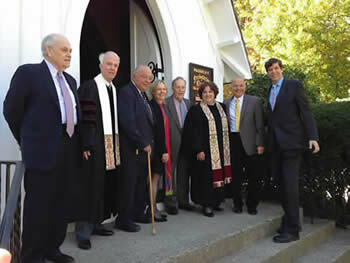 Pictured below: Commisioned Lay Parish Associate Henry Shaw, former pastors Bruce Lanford, Sidney Lovett, Laurie Ferguson, Stanley Barlow, current pastor Angela Maddalone, and Ray Bagnuolo and Bob Chase. 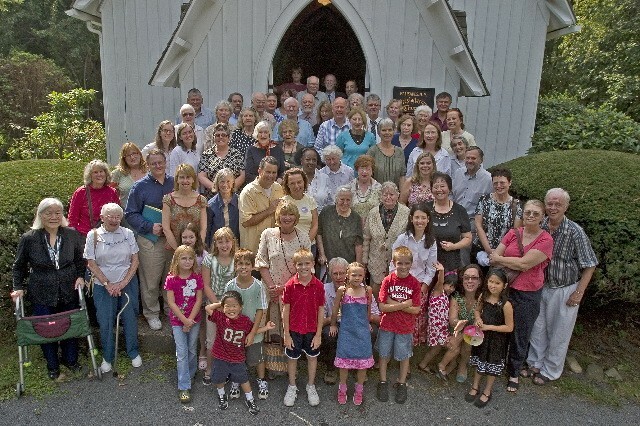 This photo was taken at the 150th Anniversary Celebration in 2014.